Sleep Party People – the bedroom project of Brian Batz – is like one of those fairy tale gems that keep radiating magical colours when it’s dark, that actually grow bigger and brighter when nighttime falls. It’s something special and important and utterly beautiful. With the aid of an old drum machine, a piano and a guitar, a unique dreamlike universe arises. With traces of My Bloody Valentine shoegaze, Cocteau Twins mystique and Flaming Lips idiosyncrasy the result is hard to define. But who cares? Sleep Party People’s eponymous debut album was received in home country Denmark with great acclaim and called “one of the strangest and most beautiful released in a long, long time”, “a hazy, dreamy and wondrous debut album” by two of the largest newspapers in the country. The album is a collection of songs including both piano lullabies, instrumental songs and what seems like pop hits from a strange, better dimension. It has a depth and a grandeur that harkens back to the big dark albums of circa 20 years ago by The Cure, My Bloody Valentine or Slowdive while remaining extremely modern. 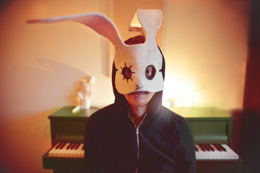 Taking a bedroom project live is always tricky, so Brian Batz has gone all out: With an orchestra of 5 friends – all clad in bunny masks – the adventurous sound is enlarged and expanded live. The band is at times gentle and at times ferocious, and has – like the album – received 5 star reviews in Denmark. The five bunnies were also handpicked by The Antlers to follow them on their Scandinavian tour in March.